About Environmental Health Consultants, Inc.
& TJL Environmental Health Consultants, Inc.
T. Joel Loving, M.S., C.E.I., founder of TJL Environmental Health Consultants, Inc., began the firm in 1984. With an undergraduate degree in Chemistry and a Master's in Analytical Chemistry, Joel has found environmental inspection, testing and management the perfect fit for his talents. Joel was previously the Hazardous Materials Officer for the University of Virginia's Office of Environmental Health and Safety, while serving on faculty at UVa for 25 years. 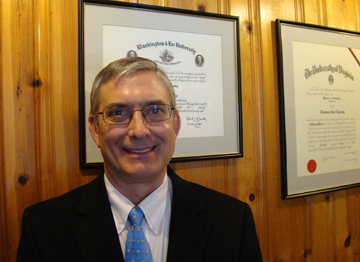 He is currently a member of the Commonwealth of Virginia Governor's Board for Asbestos, Lead, Mold and Home Inspectors. Our service area includes Harrisonburg, Charlottesville, Richmond and surrounding counties of Central Virginia. As the leading mold testing and air quality expert in Central Virginia, Joel Loving has been interviewed several times on WINA radio by Michael Guthrie, owner of Roy Wheeler Realty. Listen to the May 25, 2013 “Real Estate Matters” podcast featuring Joel Loving discussing mold control.